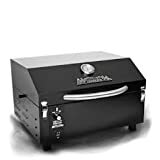 Know exactly what to consider when buying a pellet grill, explore the many reasons pellet grills shine over other grills and discover which pellet smoker is the best for your lifestyle, cooking style and particular needs. 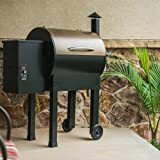 If you’re looking to purchase a pellet grill, this article will help you pick a good one that meets your needs and lasts for years. 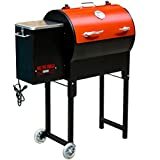 Check out the comparison tables below and read our honest pellet grill reviews to pick the best pellet smoker for your budget and needs. Wood-pellet-burning grills use an indirect cooking method, which reduces the formation of carcinogenic chemicals. Another reason I like pellet grills is that it’s like having the benefits of a smoker, a gas grill, and a wood/charcoal grill all in one. If you’re reading this, you’ve probably decided to get one and that means you’re already ahead of the 95% of grilling enthusiasts. Congratulations! Set it and forget it. Fill the hopper with pellets, set your preferred temperature (and a timer if you need) and go prepare a side dish or drink beer with friends. No charcoal grill will give you that freedom. Pellets are made of wood and they come in a multitude of flavors to choose from. No gas grill will give your food that smoky taste and flavor. 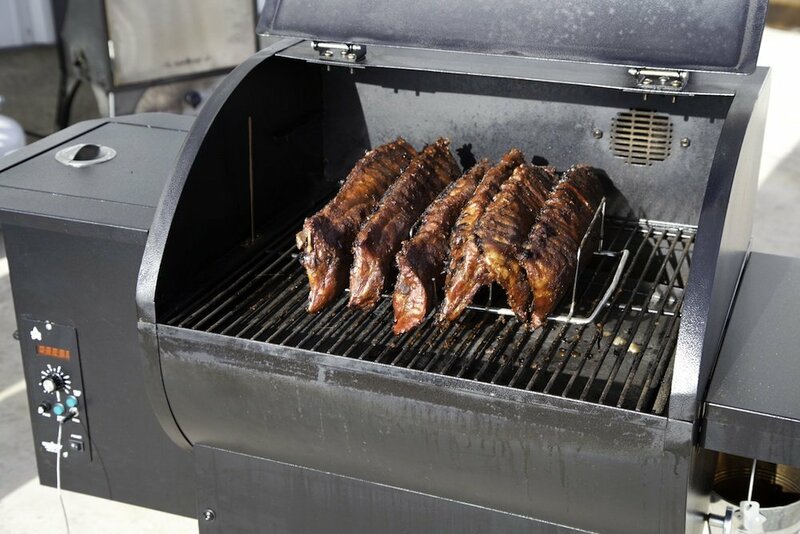 Use your pellet grill for smoking, baking, roasting, braising, slow cooking, and even frying. No gas or charcoal grill will give you so many options. 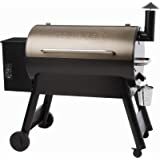 The reviewed grills here are the best rated, most popular and most reviewed pellet grills and smokers in the United States (most of them are also available for delivery to outside of U.S). 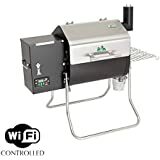 Good news if you’re one of the pellet grill fans who needs to move your grill often or just prefers to have a smaller pellet grill that you can take with should the need arise. REC TEC has come out with a smaller and portable version of their best selling wood pellet grill. 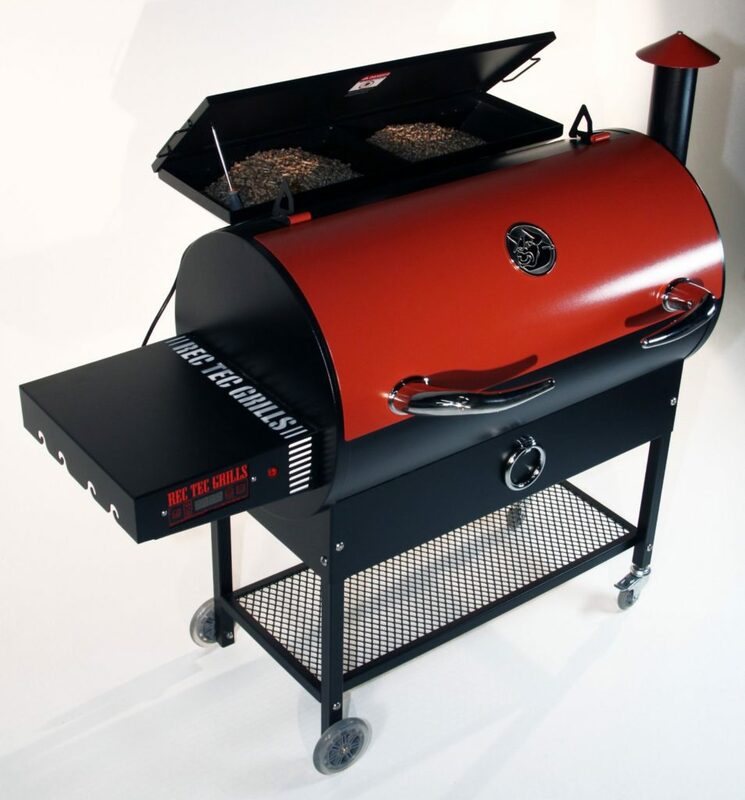 The Memphis Grills Elite Series pellet grills and smokers are the absolute best you can have. They are more expensive than your backyard pellet grills but built to last and they come with Wi-Fi which gives you the freedom to control your grill from anywhere you desire. This is our favorite pellet grill today. 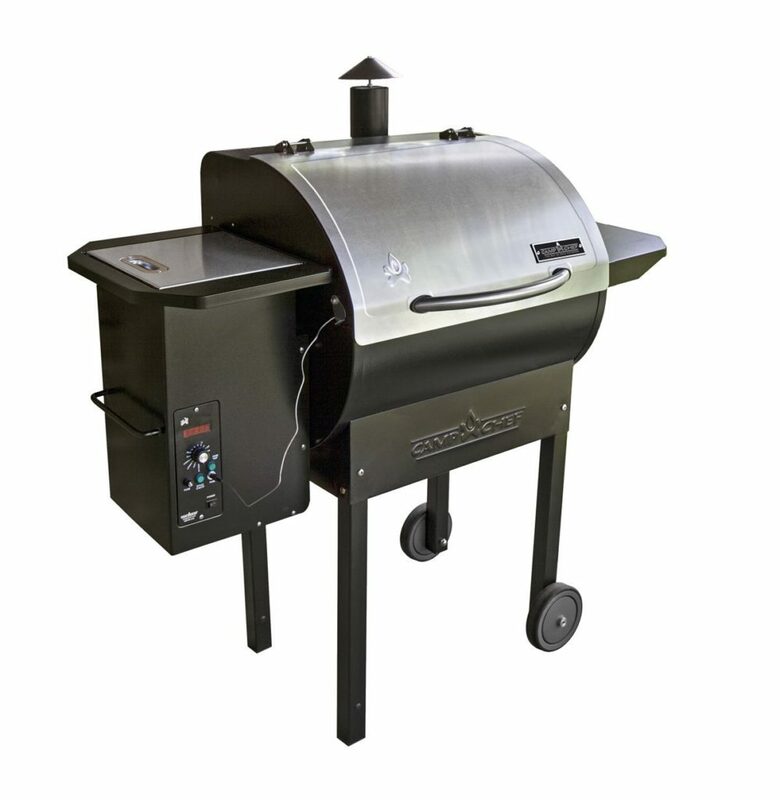 The Woodwind is a new upgraded pellet grill from Camp Chef over their SmokePro, PG24, and PG24 Deluxe. Compared to previous models, Woodwind comes with leg casters, a bottom shelf,​ blue LED screen read-out (easier to see in the sunlight), and thicker and more sturdy legs. It also has an enlarged and improved cover on the pellet hopper, stainless steel burner pot​ and upgraded thermometer probe placement. Note that the Woodwind comes in two versions: with sear box ($899) and without a sear box ($699). 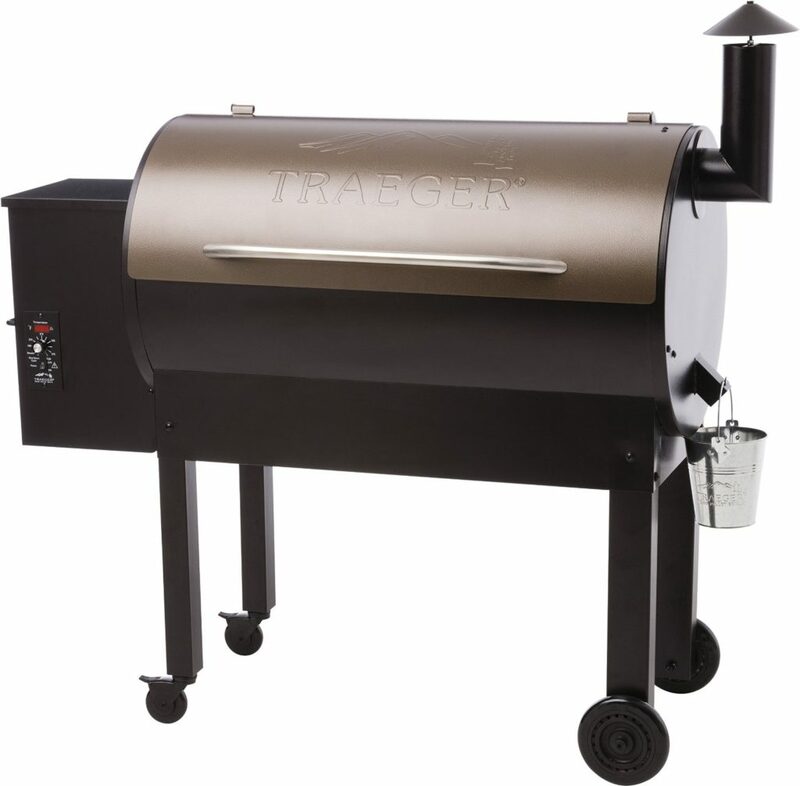 Comes with a medium sized grilling area of 19.5″ x 22″ (430 square inches). 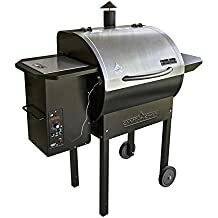 The PG24 is our second favorite pellet grill under $1,000 but it landed on the first spot (before they introduced the Woodwind) because of its better price and free shipping compared to the Rec Tec. It’s not as large as the REC TEC and the construction is not as rock-hard sturdy but it’s still very solid and definitely gets the job done. Click here to read the full review of Camp Chef PG24 pellet grill and smoker. REC TEC grills are built of 304 stainless steel in America and come with a 6-year limited warranty. I have yet to meet a person that owns a REC TEC and isn’t happy with its performance. It’s super high quality and durable. I love the features and I’m happy to pay a few hundred extra bucks for the highest quality and durability. 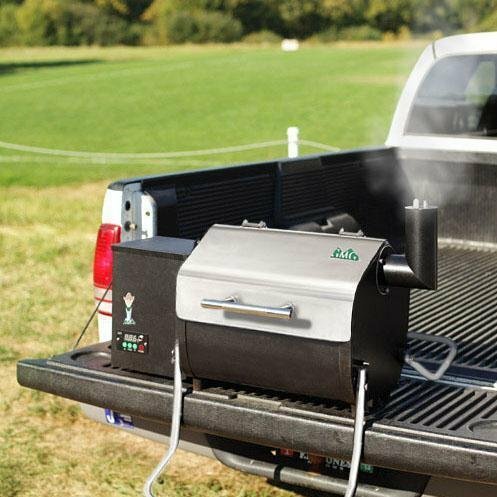 This, in my opinion and first-hand experience, is the best pellet grill out there for under $1,000. The only downside and the reason this landed on the second spot in our reviews is that when you order yours from Amazon, they make you pay $199 for shipping. Check out the video below or click to read my full review and experience with REC TEC pellet grill. This is the ultimate portable grill. It can run off a 12V with no problem so plug it into your car’s cigarette lighter. It also works 120AC so it’s perfect for home or camping, tailgating, hunting, house-boating, music festivals or anywhere you can take it! The legs are foldable and it weighs only 57 pounds so easily place in the trunk of any car. Your Davy Crocket comes with a digital Wi-Fi controller so you can control it and monitor both with iOS and Android app. 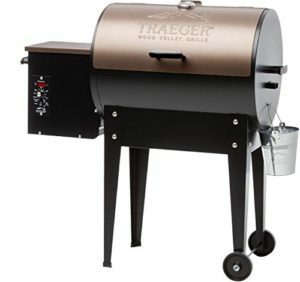 This is a small and portable pellet grill from Traeger. Comes with a small 292 square inch cooking surface, bronze lid finish, fully automatic auger, electronic auto start, digital control and a 10-pound pellet hopper. 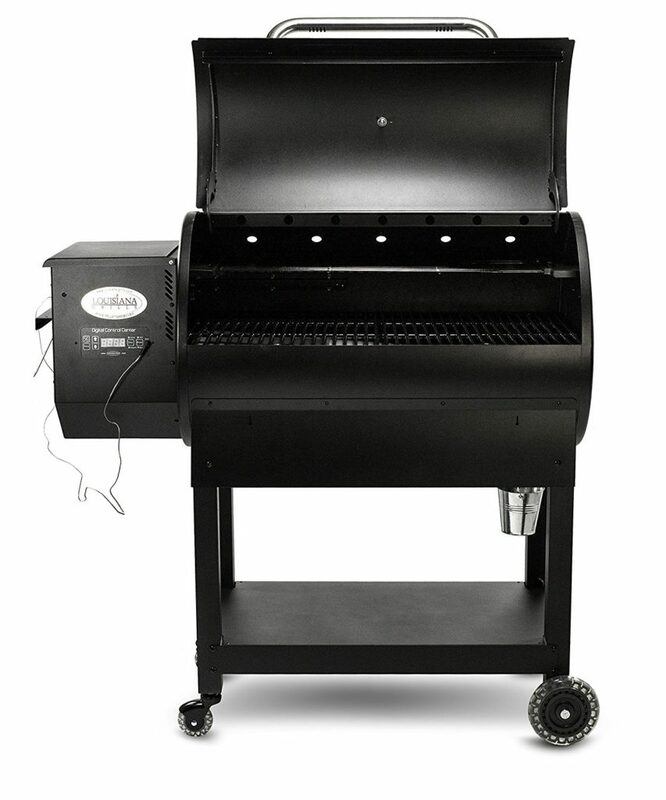 With a weight of just 70 pounds and dimensions of 21 x 23 x 21 inches, it’s one of the smallest pellet grills there is. Comes partially assembled, just attach the legs and the firebox (takes less than 30 minutes). All the necessary tools for assembly are included in the package. Really easy to use and you don’t even have to clean it after every use. This is an exclusive model built for outdoor cooking. Comes with a stainless steel lid and the construction is very sturdy. PG24S pellet grill comes with a built-in meat probe for temperature control, a 19.5 x 22 inches grilling area and an 18 lbs hopper. The unit itself weighs 131 pounds. Offers full cooking range from low to high smoke or 160 to over 400 degrees Fahrenheit (depends on pellets used etc). We like this grill a lot and another thing we like about Camp Chef is their excellent customer service. If you want to store your grill outdoors when not using it you should also get the cover to protect it from the rain and such. 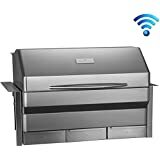 Comes with a 633 square inch main grilling surface, but also includes a 280 square inch removable upper cooking rack (total cooking area: 913 square inches). Includes a digital thermostat and gives you precise heat control from 170 Fahrenheit to 600 Fahrenheit (5 degree increments). And by using the included programmable meat probe interface, you can cook and control automatically with precision. Comes with a Flame Broiler for Open Flame Grilling. Made from heavy duty 14 gauge steel. Porcelain Cast Iron Main Grids. This is a huge pellet grill. 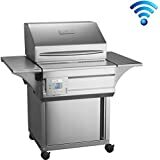 Comes with a 646 square inch (34″ x 19″) grilling area which holds up to 24 burgers or 6 chickens or 32 hot dogs or 9 rib racks. The wheels and legs have been upgraded for more stability. Comes with porcelain grill grates which are easy to clean and a digital thermostat (means from low and slow to hot and fast grilling). Note: Some people have noted problems with the temperature control. 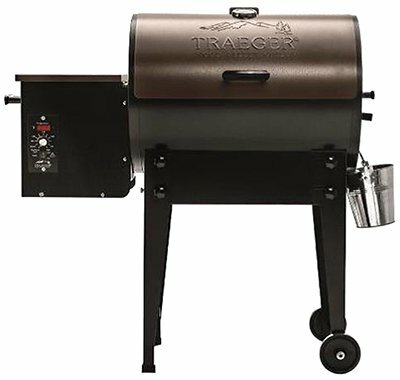 Includes a 3-year warranty like all Traeger grills. Note: more pellet grill reviews will be published soon but all our favorites have been listed above. 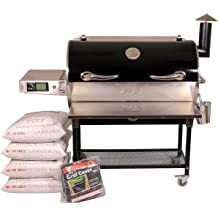 Read below for some elite pellet grill reviews, portable pellet grill reviews and our list of pellet grill deals and packages. Heats up real fast. Takes about 4 minutes to heat up to 225 degrees, 8 minutes to 400 degrees, and about 15 minutes to 600 degrees. We were impressed with how steady it holds the temperature, max fluctuation around 3-4 degrees. 341 square inch grilling area. Big enough for one turkey or 3-4 ribs or about two briskets. Efficient, you’ll go through only about 1 pound of pellets an hour when smoking at 225 F.
It’s got foldable legs so it’s easy to carry the thing from one place to another. Solid construction like it’s big brother. Comes with a 2-year warranty. As already discussed above, this is the ultimate portable grill. It can run off a 12V with no problem so plug it into your car’s cigarette lighter. It also works 120AC so it’s perfect for home or camping, tailgating, hunting, house-boating, music festivals or anywhere you can take it! 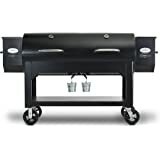 300 square inch grilling area (20 x 15 inches), holds up to 12 burgers, 18 hot dogs, 4 chickens, 3 rib racks or 1 turkey. Perfect for tailgating, small households and traveling. 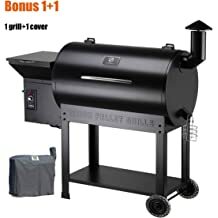 Every now and then the pellet grill manufacturers come out with deals and discount packages. It would be foolish to not take advantage of these offers. Take a look at some of the current offers available below. Pellet grill is a type of grill that uses wood pellets as its fuel source. The pellets are made of compressed sawdust. These wooden pellets are used to fuel the grill instead of charcoal or gas. However, the pellet grill works almost the same way as charcoal and gas grills combined. Pellet grills are used not only for grilling but also in baking, smoking, roasting, and more. Nevertheless, the significance of pellet grill is to imitate how charcoal works in smoking and how gas grill regulates the temperature. If you like grilling outdoors, you want to reduce the time and energy you spend using traditional and classic methods of grilling in an open air. The problem with traditional grills is that you keep on manually feeding the grill with charcoal or wood. In addition, you need to stay near the grill until the food is finally cooked. Time is as precious as your energy. In conventional grills, your waiting period is much longer, and they require much attention. On top of that, you will need to exert so much effort in setting them up and keeping them work in the entire duration of cooking. If you are sick and tired of all this, it is high time you buy a pellet grill. Moreover, pellet smokers are safe. You won’t have to worry about fire and explosion because its temperature control prevents the grill from overheating even in prolonged use. 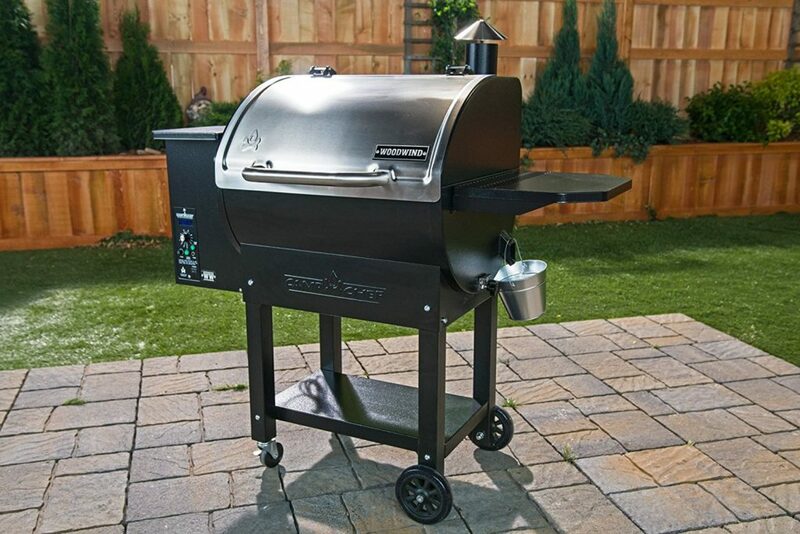 It has a deflector plate between the fire pot and grill grate to ensure that grease, oil, or meat juices will not get in contact with fire so as to prevent a sudden flare-up. First pellet grills and older models with three-position controllers have disadvantages as it is hard to achieve your desired temperature in the winter. Pellet jams are also a problem with the old type of pellet grills. Today, there is no general disadvantage that is present among all pellet grills. Each model or brand has its pros and cons. 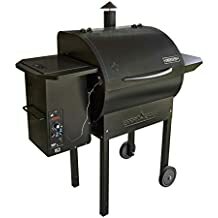 There are a lot of different pellet grill manufacturers in the market today, including some cheap Chinese ones that you should steer clear from. Every pellet grill offers a lot of benefits, but choosing a better one will not make you regret it along the way. Although it is difficult to decide which one is better, you will have an idea what to choose if you know what you need. Are you looking for a pellet grill for slow-cooking? The one with larger hopper would serve well. If you are looking for a much safer one, a stainless pellet grill is better. Before you buy a pellet grill, check if it has a PID controller. This is a built-in electronic feature that uses an advanced algorithm to accurately and safely control the cooking process based on your preferences you set. 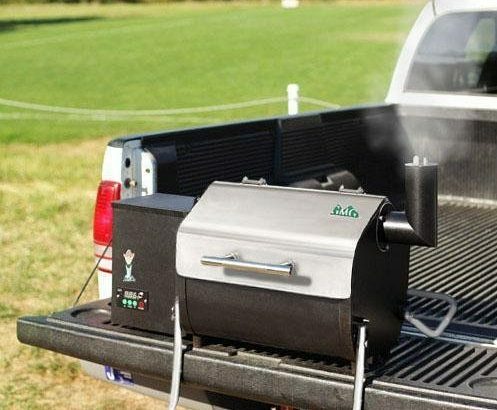 Most pellet grills today have PID so it is good to buy what the one that many people already enjoy. 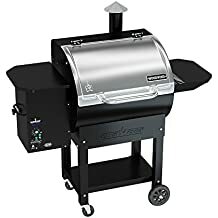 How Does It Compare to Other Grills? The only thing you may not do is steam your food as moisture may affect the grill itself. Chicken, beef, pork, and more are the ones that are ideal for a pellet grill. Fish is also good as long as you should clean the grill after use because the smell of a fish may affect the taste of meat you will cook next. Looking for inspiration? Take a look at these pellet grill recipes or these to get your juices flowing. More and more pellet grills are being manufactured now as the benefits of “pellet grilling” are being discovered and it’s a smart choice to go with if you want the taste and flavor of the wood grill and the convenience of a gas grill. Just make sure to pick a grill that meets your needs (size, features, portability) and has good customer reviews. Do your research (hopefully this article helps) but don’t overthink it – a grill in your back yard is better than no grill. Enjoy the BBQ and time with your friends and family! Any further advice you could give would be extremely appreciated. Thanks for posting your review here, Kim. Are you happy with the new Green Mountain Grill? Would love to know your thoughts on it. Cheers! 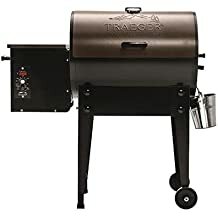 Has anyone purchased and reviewed a Traeger Timberline Smoker, their new (as of late 2017) models – double-layer stainless steel and some tech? 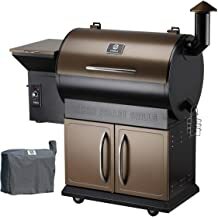 You list a number of Camp Chef models as “Best pellet smokers under $1,000. 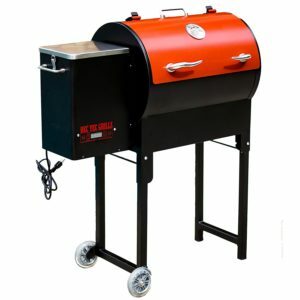 Yes, under “Best pellet grill manufacturers” Camp Chef is not listed. Is there a reason for leaving Camp Chef off that list? Are your reviews from customers or from an independent lab like Consumer Reports? Best smoker manufacturers omits Camp Chef, yet you rate several Camp Chef smokers very high, even stating Top Rated. Reason? I have owned a Camp Chef Woodwind for over a year and love ease of cleaning, delicious smoked meats, and remain impressed smoked burgers do not fall apart like grilled.